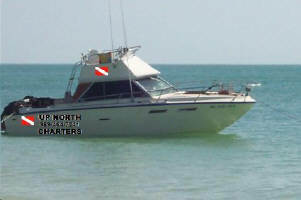 Come dive the shipwrecks of Thunder Bay, Presque Isle or the Straits of Mackinac with us. Our 25' 6-pack boat is fast and comfortable. We can do groups of 6-12 divers making a morning and afternoon trip. Our vessel can be trailered putting us closer to the wrecks saving on travel time.